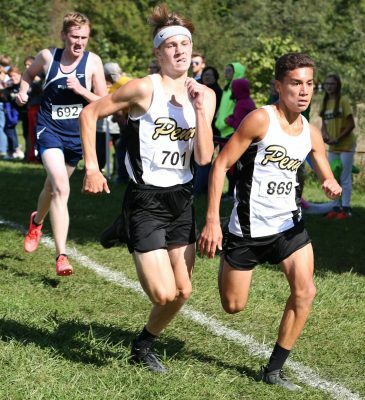 This past Saturday at the largest meet of their season when it comes to the number of teams, the Kingsmen Freshman-Sophomore team won the prestigious New Prairie Invitational in dominant fashion. The Kingsmen won the meet with a score of 36, defeating the second place team by 30 points. The Kingsmen were led by freshman Mariano Retzloff who ran the challenging course in a time 17:01.90. Retzloff also won the race individually, coming in first place in a race of over 200 runners. In second for the Kinsmen and in 4th overall was Dillion Pottschmit who finished the course in a quick time of 17:25.10. Next for the Kingsmen was Jacob Meek who finished the race in 17:40.20, who came in 6th overall. Ben Boardley finished 11th overall with an 18:07.80. Freshman Carter Kaser sealed the deal for the Kingsmen finishing just behind Boardley with a time of 18:08.80, placing 14th overall. Joey Rutten finished 6th for Penn in this race, placing 17th overall in 18:15.70. Taylor Cussen placed 44th overall with an 18:58.60. Overall it was a great showing by the Kingsmen. This performance by the underclassmen is a good sign for the future of Penn Cross Country.